USES: This medication is used to treat sudden diarrhea (including traveler's diarrhea). It works by slowing down the movement of the gut. This decreases the number of bowel movements and makes the stool less watery. Loperamide is also used to reduce the amount of discharge in patients who have undergone an ileostomy. It is also used to treat on-going diarrhea in people with inflammatory bowel disease. 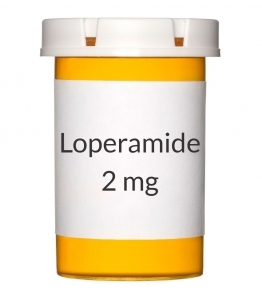 Loperamide treats only the symptoms, not the cause of the diarrhea (e.g., infection). Treatment of other symptoms and the cause of the diarrhea should be determined by your doctor. Do not use in children younger than 6 years unless directed by your doctor. This medication should not be used in infants younger than 24 months. HOW TO USE: If you are using the over-the-counter product to self-treat, read all the directions on the product package before taking this medication. If your doctor has prescribed this medication, follow your doctor's directions and the directions on your prescription label. If you have any questions, consult your doctor or pharmacist. Take this medication by mouth, usually after each loose stool, or as directed by your doctor. Dosage is based on your condition and response to therapy. In children, dosage is also based on age and weight. Adults should not use more than 8 milligrams in 24 hours if self-treating, or 16 milligrams if under a doctor's direction. If you are taking the chewable tablet, take this medication on an empty stomach. The chewable tablets should be chewed thoroughly before swallowing. If you are using the rapidly dissolving tablets, dry your hands before opening the blister pack to carefully remove a tablet. Do not push the tablet through the blister pack. Place the tablet on the tongue, allow it to dissolve completely, then swallow it with saliva. Do not crush, split, or break the tablet before taking it. Do not remove the tablet from the blister pack until just before taking. No water is needed to take this medication. Diarrhea can cause a serious loss of body water (dehydration). Drink plenty of fluids and minerals (electrolytes) to replace what is lost. Tell your doctor immediately if you develop signs of dehydration (e.g., extreme thirst, decreased urination, muscle cramps, weakness, fainting). You may also need to change to a bland diet during this time to reduce irritation to your stomach/intestines. Consult your doctor or pharmacist for more information. Tell your doctor if your diarrhea does not improve after 2 days, if your condition worsens, or if you develop new symptoms. If you develop blood in the stool, fever, or an uncomfortable fullness/swelling of the stomach/abdomen, or if you think you may have a serious medical problem, seek immediate medical attention. If you are taking this medication under your doctor's direction for ongoing diarrhea, tell your doctor if your diarrhea continues after 10 days of treatment. SIDE EFFECTS: Dizziness, drowsiness, tiredness, or constipation may occur. If any of these effects persist or worsen, contact your doctor promptly. If your doctor has prescribed this medication, remember that he or she has judged that the benefit to you is greater than the risk of side effects. Many people using this medication do not have serious side effects. Stop taking this medication and seek immediate medical attention if any of these unlikely but serious side effects occur: severe constipation/nausea/vomiting, stomach/abdominal pain, uncomfortable fullness of the stomach/abdomen. A very serious allergic reaction to this drug is rare. However, seek immediate medical attention if you notice any symptoms of a serious allergic reaction, including: rash, itching/swelling (especially of the face/tongue/throat), severe dizziness, trouble breathing. This is not a complete list of possible side effects. If you notice other effects not listed above, contact your doctor or pharmacist. In the US - Call your doctor for medical advice about side effects. You may report side effects to FDA at 1-800-FDA-1088. In Canada - Call your doctor for medical advice about side effects. You may report side effects to Health Canada at 1-866-234-2345. PRECAUTIONS: Before taking loperamide, tell your doctor or pharmacist if you are allergic to it; or if you have any other allergies. This product may contain inactive ingredients, which can cause allergic reactions or other problems. Talk to your pharmacist for more details. This medication should not be used if you have certain medical conditions. Before using this medicine, consult your doctor or pharmacist if you have: stomach/abdominal pain without diarrhea, bowel obstruction (e.g., ileus, megacolon, abdominal distention). The rapidly dissolving tablets may contain aspartame or phenylalanine. If you have phenylketonuria (PKU) or any other condition that requires you to restrict your intake of aspartame or phenylalanine, consult your doctor or pharmacist regarding the safe use of this medicine. Antibiotics may rarely cause a severe intestinal condition (Clostridium difficile-associated diarrhea) due to a type of resistant bacteria. Symptoms include: persistent diarrhea, abdominal or stomach pain/cramping, or blood/mucus in your stool. This condition may occur weeks after antibiotic treatment has stopped. This medication may make this condition worse. Do not use this anti-diarrhea product, especially after recent antibiotic use, if you have the above symptoms without talking with your doctor first. This medication should not be used without seeing your doctor first if you have certain medical conditions. These symptoms/conditions may require other treatment before you can use this medication safely. Before using this medication, tell your doctor or pharmacist your medical history, especially of: black/tarry stool, blood/mucus in your stool, high fever, HIV infection/AIDS, liver problems, certain stomach/intestinal infections (e.g., Salmonella, Shigella), certain type of bowel disease (acute ulcerative colitis). This drug may make you dizzy or drowsy. Do not drive, use machinery, or do any activity that requires alertness until you are sure you can perform such activities safely. Avoid alcoholic beverages. Caution is advised when using this drug in children because they may be more sensitive to the effects of the drug, especially the drowsiness effect. Children are at higher risk for dehydration. (See also Uses, How to Use sections.) During pregnancy, this medication should be used only if clearly needed. Discuss the risks and benefits with your doctor. This drug passes into breast milk but is unlikely to have undesirable effects on a nursing infant. Consult your doctor before breast-feeding. DRUG INTERACTIONS: If you are taking this medication under your doctor's direction, your doctor or pharmacist may already be aware of any possible drug interactions and may be monitoring you for them. Do not start, stop, or change the dosage of any medicine before checking with them first. This drug should not be used with the following medication because a very serious interaction may occur: pramlintide. If you are currently using the medication listed above, tell your doctor or pharmacist before starting loperamide. Before using this medication, tell your doctor or pharmacist of all prescription and nonprescription/herbal products you may use, especially of: recent/current antibiotic use, drugs that can cause constipation (e.g., anticholinergics such as belladonna/scopolamine/benztropine, antispasmodics such as glycopyrrolate/oxybutynin, potent narcotic pain medicines such as morphine, certain antihistamines such as diphenhydramine, tricyclic antidepressants such as amitriptyline), cholestyramine, quinidine, ritonavir, saquinavir. This document does not contain all possible interactions. Therefore, before using this product, tell your doctor or pharmacist of all the products you use. Keep a list of all your medications with you, and share the list with your doctor and pharmacist. OVERDOSE: If overdose is suspected, contact your local poison control center or emergency room immediately. US residents can call the US National Poison Hotline at 1-800-222-1222. Canada residents can call a provincial poison control center. Symptoms of overdose may include: difficult urination, slowed breathing, deep sleep.